The oldest United States military survivor of the Japanese attack on Pearl Harbor on the morning of December 7, 1941, has died at the age of 106. Veteran Ray Chavez was present at the naval base on the fateful day that saw America drawn into World War II. It was early in the morning when Japanese fighters and bombers appeared off the coast, some even waved to people on the ground as they looked up at the swarm of unknown aircraft. Chavez was suffering from pneumonia and died in his sleep in San Diego's Poway suburb, according to his daughter Kathleen Chavez. The 106-year-old even made a visit last May to Washington D.C. where he was honored by President Donald Trump on Memorial Day. The White House celebrated his presence with a photograph captioned, "We were honored to host him at the White House earlier this year. Thank you for your service to our great nation, Ray!" The brutal attack on Pearl Harbor killed 2,335 service members, 68 civilians, and wounded another 1,143. The American Navy also lost a substantial portion of its Naval fleets including 4 battleships and over 188 aircraft and other ships like cruisers, tubs, and destroyers. The surprise attack was carried out under the command of Japan's Vice Admiral Mitsuo Fuchida and was meant to prevent the U.S. Pacific Fleet from interfering with its planned campaigns overseas against territories of the United Kingdom, Southeast Asia, and the Netherlands. What Vice Admiral Fuchida did not know was that the majority of America's largest ships, the aircraft carriers, were currently in Australia. 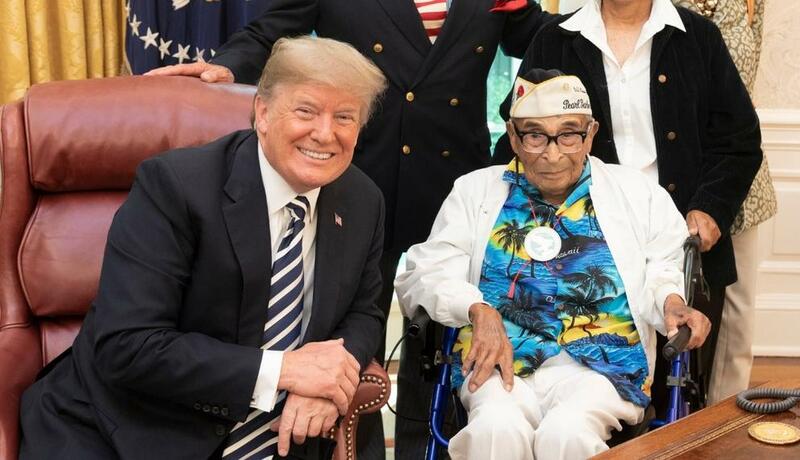 The White House Tweeted, "We are saddened to hear the oldest living Pearl Harbor veteran, Ray Chavez, has passed away at the age of 106. We were honored to host him at the White House earlier this year. Thank you for your service to our great Nation, Ray!" The chief historian for the National Park Service at Pearl Harbor, Daniel Martinez, confirmed that Chavez was indeed the oldest survivor of the fateful attack. Chavez offered a few powerful words during a 2016 ceremony commemorating the 75th anniversary of the attack. "I still feel a loss," Chavez said. "We were all together. We were friends and brothers. I feel close to all of them." Chavez was stationed aboard the minesweeper vessel called the USS Condor which patrolled the harbor's eastern side when he noticed an ominous sight, a periscope sticking out of the water. The periscope was attached to a Japanese submarine and was spotted just hours before the attack. Chavez's ship notified a destroyer that soon hunted the submarine and destroyed it but little did they know what was to follow. Just hours after the Japanese submarine was sunk outside the harbor, Chavez had finished his night shift and had headed home for the night. He even told his wife not to wake him since he had been up all night. "It seemed like I only slept about 10 minutes when she called me and said, 'We're being attacked'," Chavez said during the 2016 ceremony. "And I said, 'Who is going to attack us?' "
"She said, 'The Japanese are here, and they’re attacking everything'." By the time Chavez had returned to the base the whole harbor was in flames. He spent the next week sifting through destruction and working around the clock to find survivors and clear the debris. Chavez was eventually assigned to the transport ship USS La Salle which was used to ferry troops, tanks and equipment. He left the military in 1945 due to severe post-traumatic stress disorder. After his passing, his daughter said, "He loved trees and he dearly loved plants and he knew everything about a plant or tree that you could possibly want to know," his daughter said Wednesday with a chuckle. "And he finally retired when he was 95." It took decades for her father to open up about the attack on Pearl Harbor but he eventually began attending the annual memorial ceremonies. it stands to reason that a guy who was warned about 9/11 by his "good friend" Larry Silverstein would be promoting the other false-flag attack that killed thousands of americans that also took America to war ON LIES.